BY MOST measures, the UK is the world’s sixth wealthiest nation. It’s also one of the world leaders in digital technology. As such, you’d think it would be near the top of the global league tables in terms of broadband infrastructure. And so it is, in certain respects. According to Cisco, the UK boasts one of the highest levels of internet adoption in the world. Internet-related economic activity amounted to a larger proportion of GDP than any other country in the 35 member countries of the OECD. Last year, the UK attracted investment in digital technology amounting to £6.8 billion, more than any other European country. But then the statistics start to go pear-shaped. Fast broadband requires the use of fibre-optic cable. The main players engaged in installing fibre-optic in the UK are BT’s Openreach (which has been allegedly dragging its feet for years to protect its legacy investment in copper wires) and Virgin Media (owned by Liberty Media since 2013), whose network now covers around half of all UK households. Although Virgin in particular has been steadily raising broadband speeds over the years, both Virgin and Openreach have a problem. The fibre-optic cable normally goes only to a street cabinet. The “final mile” to homes or business premises is via copper wire. The further the distance from the street cabinet to the customer, the more the signal speed degrades. Typically, a fibre optic link with copper for the “final mile” will be only 10% of the speed of a full-fibre cable. Hence the drive towards so-called “full fibre”, with no copper wires. Not only does this provide significantly more bandwidth; it’s also inherently more reliable. Over 90% of premises in Japan and South Korea have access to full fibre. Even in Spain and Portugal, more than 70% of premises have full fibre. In the UK, the figure is a miserable 2%. The only consolation for us is that Germany isn’t much better. Before I go any further, it’s worth summarising the reasons why fast broadband access is needed. For consumers, demand is rapidly increasing thanks to the advent of video streaming services from the likes of Netflix, Now TV and Amazon Prime. Even more bandwidth will be required as ultra-high definition TV gains traction. For businesses, a fast and reliable broadband service is regarded as critical. Yet according to the Federation of Small Businesses, 14% of small businesses say that slow and/or reliable broadband is holding them back. Incredibly in this day and age, 45,000 businesses still rely on a dial-up connection. And in business parks around the country, almost half of all small businesses cannot get speeds above 10Mbps, one tenth of the base Virgin Media package offered to new customers. In the public sector, the relentless advance of digital technologies means that much higher bandwidth is required for hospitals and schools in particular. According to Cisco, we’ll see global mobile data traffic increase sevenfold between 2016 and 2021. The 5G mobile technology will bear much of the brunt of this – but 5G will require many more cells. To handle the traffic at high speed, these cells need to be connected to the main base stations using full fibre. That, then, is the background to our next share: CityFibre Infrastructure Group, the rapidly growing competition to Openreach, Virgin and the rest. Peer into its 3,200km of ducts, and you won’t find any copper there. This is end-to-end full fibre. It already provides broadband services to 60 towns and cities, as well as an 1,100 km long-distance network that connects to key points in London. Its infrastructure covers an addressable market of 28,000 public sites, 7,800 mobile masts, 280,000 businesses and 4m homes. CityFibre is very much a ’jam tomorrow’ company. Initially, it has to spend hundreds of millions of pounds building the infrastructure before the big revenues start to roll in. But once the network is built, it costs next to nothing to run, which means gross margins of around 90%. Actually, the huge construction costs are somewhat mitigated by others putting up some of the money. CityFibre is an “open access” infrastructure provider. Unlike, for example, Virgin Media, which has exclusive use of its own network, more than one organisation can pump information through Cityfibre’s networks. These organisations are called ‘channel partners’. CityFibre currently has more than 50 of them. They may be business or consumer internet service providers (ISPs), mobile operators such as Vodafone or public sector integrators. When planning to build a new network, CityFibre secures a long-term ’anchor contract’ with a channel partner. That partner will then typically advance a significant p ortion of the capital cost prior to the start of construction. Incidentally, as well providing fibre optic networks that can be used by any channel partner, CityFibre also provides “dark fibre”, which provides very high bandwidth for the exclusive use of one channel partner. To get the network ’lit’, the channel partner has to provide its own electronic equipment at either end of the fibre strand. Some big news came out less than three weeks ago: a new partnership with Vodafone, the mobile telecoms giant. CityFibre will provide full-fibre connectivity to one million homes in 12 towns and cities, with the potential to expand this to up to five million homes in approximately 50 towns and cities by 2025. Construction is expected to start next year and is likely to cost between £500m and £700m. Vodafone has committed to lease this capacity from CityFibre for a minimum of 10 years, and has granted CityFibre a period of exclusivity, mainly during the construction phase. It’s a large-scale deal and makes CityFibre a credible competitor of Openreach and Virgin. For investors, there are two main risks here. The first is that that it will cost CityFibre a huge amount to build the network. It reckons each home will cost between £350 and £480 to connect. If it has underestimated the costs, it may have to come back to shareholders for more money. They won’t like that. But the new partnership should generate £500m in revenue for CityFibre over 20 years – and there’s nothing to stop CityFibre from signing up other channel partners once the network is built. The second risk, related to the first, is that CityFibre has in the past raised capital using a deep-discount institutional placing. The problem with this is that small shareholders who buy the shares shortly before the placing find that the share price then plummets because of the dilution. They have no opportunity to buy more shares to counterbalance the dilution, as they would have it was a placing and open offer (i.e. an offer to the public as well as the institutions). Cityfibre has taken quite a bit of flak in the past for shafting private investors in that way. Let’s hope it has learnt a lesson from that. As against these risks, the government is fully behind the roll-out of full-fibre. In last year’s Autumn Statement, it pledged £1.14 billion to support the full-fibre roll-out. It also announced 100% business rates relief for 5 years on all new full-fibre infrastructure. CityFibre will benefit from that. When will the company move into the black? We haven’t yet come across any broker prepared to stick its neck out and hazard a guess. Bit this is one of those companies whose revenues are growing at such a lick that, at some point, they will outpace expenditure. So long as the company maintains its top-line growth and keeps its losses relatively low, I’m sure that investors will be patient. Just bear in mind that the share price will very likely give you a bumpy ride. Of the six brokers that follow the company, one (Numis) rates it a ‘sell’; the other four rate it a ‘buy’ or ‘strong buy’. The consensus target price for the share is 100p, which is nearly 70% above the current price. 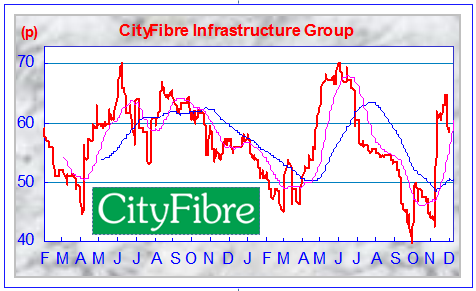 BUY (58.5p; forecast yield: nil; market capitalisation: £373.3 million; initial stop-loss: 47p; EPIC: CITY; sector: Communications & networking; classification: AIM; website: www.cityfibre.com/investors).